Asus has launched a slew of products featuring Nvidia's frame-synching G-Sync technology at Computex 2015. First up is the ROG 3800R 34-inch curved G-Sync monitor, which sports a 3,440 x 1,440 pixel-resolution resolution with a 'cinematic' 21:9 aspect ratio, G-Sync, DisplayPort and HDMI. A second panel, the ROG Swift PG279Q, is a 27-inch panel with a WQHD resolution of 2,560 x 1,440. One for gamers with beefy rigs, it comes with a 144Hz refresh rate, G-Sync, and features DisplayPort and HDMI connections. Not everything came with G-Sync inside, however; the ROG G751JT/JY is a gaming notebook that comes with an Intel Core i7 CPU and is configurable with up to an Nvidia GeForce GTX 980M mobile graphics chip. 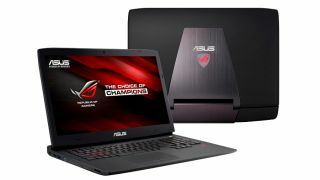 It's joined by the Asus ROG G501, an ultra-thin gaming laptop that also comes with an Intel Core i7 CPU and Nvidia GeForce GTX 900 series graphics, a 4K or UHD display and Asus's Hyper Cool tech that helps keep temperatures down under heavy load. Asus also lifted the lid on the ROG Poseidon GTX 980 Ti graphics card, which the company claims delivers cooler temperatures, improve noised reduction and three times quieter performance compared to the GTX 980. No pricing or launch dates have been revealed at this point.